All representative societies have the rule of law as a cornerstone; a compilation of rules to ensure that the weakest of citizens are protected from the powerful. The powerful are always tempted to do what is right in their eyes. Regardless of motivation, the rule of law intends to limit the exercise of power. In a similar manner, I have a tendency to try and subjugate God to my concept of the rule of law. I conjure a rule of love by which I seek to constrain the power of the divine into a paradigm that is acceptable to my sensibilities. My rule of love encompasses all that is lovely and kind and pleasant. I easily attribute all the byproducts of this rule of love to God. However, my concept of the rule of love gets me into trouble when I read books like Jeremiah. The prophecies of Jeremiah crush my feeble boundaries of love. God’s wrath confronts my sensibilities. I am tempted to retreat back into my little paradigm of love and turn away from the reality that the wine of God’s wrath has been and will be poured out upon a rebellious people. The sword that the Lord sent among them was the nation of Babylon. The creation of the Babylonian empire was a brutal and horrifying saga of conquest. Love was not the message of the Babylonian armies. 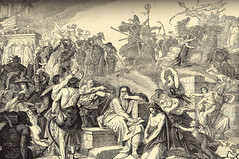 Death, misery, and suffering were the result of resisting the armies of Babylon. Yet, it seemed right to God to give the Babylonians their empire. Babylon was neither the first nor the last empire to gobble up vast portions of the earth. History tells us of the Aztecs, Inca, Assyrians, Persians, Egyptians, the dynasties of China, the Mongols, Romans, Byzantines, Ottoman, Nazi, Soviet, British, Japanese, and American; just to name a few. God has allowed them all. He was the one who determined it was right for them to rule. Consider all that these conquerors have done to the conquered in the name of empire. The savagery that humans have done to one another in the name of conquest turns my stomach and confounds all that I understand to be right and wrong, good and bad. Conquest does not fit into a warm-fuzzy concept of the rule of love. Many have turned from the God of the Bible when their concept of a loving God will not fit into biblical portrait of God that includes His wrath. “A loving God would not do that”, is a statement that I have often heard. Others refuse to look upon those scriptures that teach of God’s wrath. Still others create theologies that make God respond to the development of empires, the atrocities perpetrated on the conquered, and all other forms of evil in this world. These are all attempts to subjugate God to a rule of law that we have created; a rule of love that elevates God’s love above His wrath. We forget the world that we live in. This earth is not a world of love. It never has been. If it were a world of love, then we would not need a Savior. The evil and sinful acts that happen every day in this world testify to our need of a Savior and remind us that we live in a world facing God’s wrath. I believe that it is revealing that God’s wrath can be seen in the actions that are most clearly absent of His love. When God’s love is withdrawn, the evil of man’s rebellious heart can be clearly seen. Likewise, it is good for us to behold a world without God’s love that faces only His wrath. We do a disservice to all who walk in the flesh when we focus only on God’s love and ignore His wrath. The warnings of God’s wrath are intended to persuade the lost to mend their ways and deeds and obey the voice of God. All the evil that is perpetrated on this earth should remind us of our need for God’s love. That is why Christ came to this world. He did not come to make this world a nicer place. He came to save sinners from the just wrath of the Father. God’s most loving act was the sending of His own son in the likeness of sinful flesh and for sin to condemn sin in the flesh. That is how God showed His love to the world. The full revelation of God’s love is what is necessary to satisfy the final demonstration of God’s wrath. We either accept all of God’s love through Jesus Christ or we get none of it. That is the rule of love. PRAYER: Lord, I fear your wrath. I fear it for myself and for my enemies. I fear a world that is absent your love. Thank you for sending your son to save a sinner like me. Thank you for showing such great love to this rebellious and sinful world. Lord, I want all of your love. Forgive me for those times that I have not valued your love for me as I should. Forgive me for those times that the joy of my salvation, the joy in your love, does not radiate from my being. Thank you for reminding my of your wrath and turning once again into the loving arms of your embrace. I pray this in the precious name of your Son, Jesus Christ. Amen. I was recently going through some old papers and ran across a list of goals that I had written shortly after graduating from the University. I was newly married, had a new career, and was on the cusp of the adventure called my life. I remember making that list. I remember the reasons for making most of those goals. Through the last couple decades, I have been successful in achieving most of them. I find it interesting that the reality of now standing on the future side of that list does not match the anticipation felt when condensing dreams into goals and writing them on paper. I have found that to be the universal case. Reality has a hard time living up to my dreams. My mind creates theater. It does not create documentaries. My mind creates a stylized version of reality, past or future, that can be mesmerizing. My mind can direct a whole world of utter fantasy. The mental special effects of this world can be so convincing that reality blurs with the make-believe. I can become so enamored with the theater of my mind that I love it more than what is real. The real is the present. The real comes to us with all of its flaws and imperfections. The real has uncertainty. The real can hurt us and make us unhappy. The real can disappoint. Our minds often create elaborate sets to soften the stark documentary quality of the present. However, the present is the only thing that is real. Everything else is a dream or a fading memory. The battle for the real has tangible consequences for how we love. We all love much and in a variety of ways. We can love our family as we want them to be. We can love what we thought marriage would be. We can love what our job is when we get that promotion. We can love what we were. We can love what we will be. We can love what we will obtain. We can love them based on what they should have done or did not do. Our love can easily slide from what is real to a theatrical concoction of our mind. God loves me. He does not love a future me or a past me. He loves the present me. He loved me before I loved Him. His love is not conditioned upon me becoming the someone I long to be. His love is for the real me; the present me. In the same way, God has called us to love others. We are to love real people. We are not called to love a person who we hope someone will become. We are not called to love someone who used to be someone else. We are to love real people. That means we are to love people as they are. We are to love real people with all their faults and failures. We are to love people with all of their blemishes and bandages. We are to love people in their weaknesses and through their wanderings. This does not mean that weaknesses are irrelevant. Weaknesses are the touchstone of the real. It is only in the dream where a weakness drives one away from another. A weakness will destroy a dream. Therefore, the love of the make-believe is fragile and can be easily crushed by the weaknesses of a real person. However, a real person’s weakness can truly be conquered when we love that present person. When we love the real person, we are drawn closer by their weaknesses. The love of the real person becomes our motivation to strengthen them in their weaknesses. We pick up their cry when they have disappointed, once again. We lift them up when they have stumbled, once again. The love of a real person does not have a limit since it does not rely upon the conditions of a dream. This is the way that God loves us. We are justified in Christ. He has given us His Spirit to overcome the weaknesses of our flesh but the love that He gives us today does not depend upon what we hope to be. God loves real people. May we love like He has loved us. PRAYER: Lord, help me to love others as you love me. Forgive me for loving dreams. Help me to love others where they are today. Help others to love me where I am today. Father, I want to have a limitless love for You and other people. Fill me with the love that only can come from you. I pray this in the precious name of your Son, Jesus Christ. Amen.